Most people are familiar with the zucchini fruit, which is often used in a variety of vegetable dishes. But the fruit is not the only edible part of the plant. 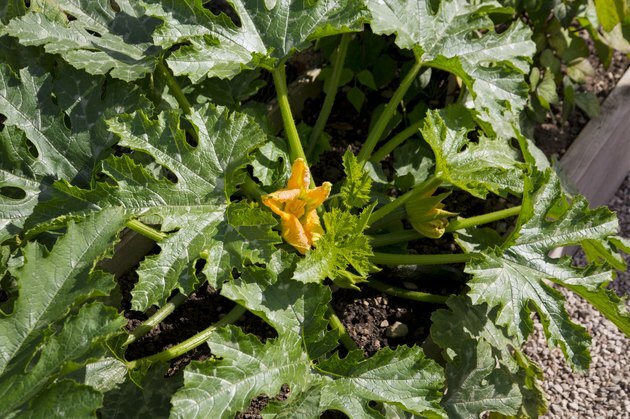 In fact, the zucchini leaves and flowers of young zucchini plants are also edible. As long as you pick the leaves from a young plant -- older plants provide bitter leaves -- you can cook the tender leaves in multiple ways. Bring a large pot of water to a boil. Once boiling, add the zucchini leaves to the water and stir. Boil the zucchini leaves for just about one minute; boiling the leaves too long gives them a mushy texture. Pour the pot of water into a strainer, allowing the water to drain away from the zucchini leaves. Immediately rinse under cold water for one to two minutes. Squeeze the zucchini leaves to remove the excess water. Deposit the leaves into a bowl and add additional seasonings and ingredients as desired. Options include minced garlic, olive oil, salt, pepper, chopped onion, Parmesan cheese and crushed red pepper flakes. Mix the ingredients with an electric mixer until a thick paste forms. If desired add additional chunky ingredients, such as chopped tomato or diced black olives. Spread the zucchini leaf paste onto toasted bread, crackers, tomato slices or use it as a dip for raw vegetables and pita chips. Rinse the zucchini leaves under cold running water, using your fingers to clean the entire surface of the leaves. After rinsing, squeeze the leaves to eliminate excess water. Chop the zucchini leaves into small pieces using a paring knife. If you will be eating the sauteed leaves as a salad or side dish, leave the pieces on the larger side. If you will be using the sauteed leaves as a topping for another dish, chop the leaves into smaller pieces. Heat 1 to 2 tbsp. of olive oil in a skillet over medium heat. Once the oil is smoking, add the chopped zucchini leaves to the skillet and saute over medium heat for approximately four minutes. Turn the leaves once, halfway through cooking. Remove the zucchini leaves from the skillet with tongs and immediately place them on a thick layer of paper towels to drain. Add additional ingredients and seasonings to your zucchini leaves as desired. The sauteed leaves can be served hot, room temperature or chilled. A hot zucchini leaf salad might be mixed with fresh garlic, salt, pepper and chopped tomatoes. A cold zucchini leaf salad, on the other hand, might be mixed with cottage cheese, shaved Parmesan cheese or diced black olives.